Brexit will change the course of Britain and Europe in the coming months and years. Dattu Bhokanal, an army man from the drought prone region of Talegaon, once afraid of water, qualifies for the Olympics in water sports. England and Pakistan go at each other in a tightly contested Test series. And what lies beneath Cambodia? Raghuram Rajan becomes the first governor since 1992 not to be given a customary 2 year extension. He quits under the most dubious circumstances. Where does that leave India? Meanwhile, India's attempt to join the Nuclear Suppliers Group crashes yet again. Mohammad Ali, the greatest athlete of all time passes away and Anil Kumble is India's new head coach. Sania Mirza and Leander Paes win Wimbledon titles by pairing with Martina Hingis. In cricket, Bangladesh is on a high and so is match fixing in the IPL. Old Monk, the iconic Indian rum needs some reviving. Iran and US ink a historic nuclear deal. And El Shorty Chapo escapes from Mexico's most secure prison. You need not be big to be good. In this episode, deputy editor N Madhavan talks about India's super 50 companies. How simple ideas make great investments. In this podcast, editor finance Pravin Palande summarises the views of some top fund managers who believe that keeping things simple is a great hallmark of investments. The $40 billion Aditya Birla Group is quietly building a financial services superstore. Can it succeed? An eager country — and an intrigued world — has been waiting for the promise of Narendra Modi to unfold. A lot is riding on the next four years. You need not be a multi-product behemoth to become an ecommerce success story. Consider the rise of the verticals and enablers. 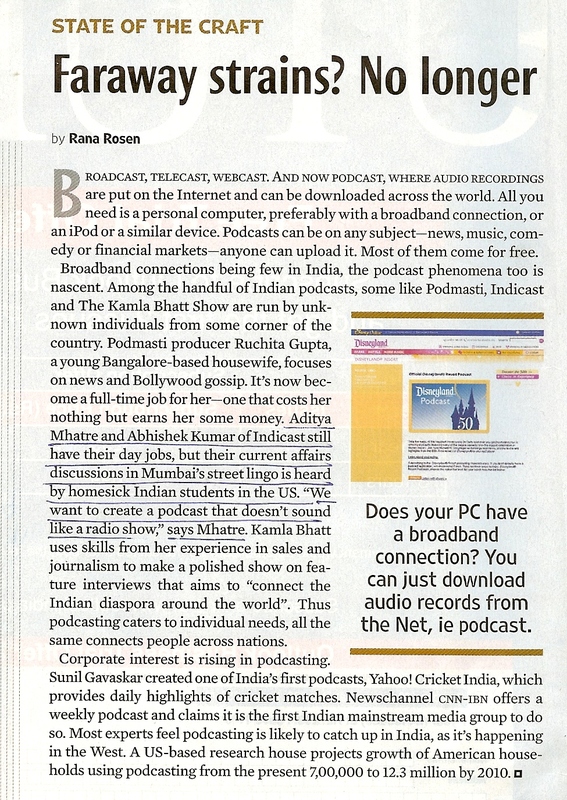 "Indicast is home to India’s longest running podcasts with 250+ episodes and over a million downloads." Coverage by print media publications like Economic Times, HT, Mid-Day, Outlook and many more.